The communities of Yucala, Mesa Bajo, and Naranjala are facing a slow and deliberate process of displacement by a key army base used by the U.S. military in Colombia. Seven military bases in Colombia fell under the U.S.-Colombia Defense Cooperation Agreement, which while never implemented, would have formalized an already existing relationship of U.S. Military access to Colombian bases. And one of those is Tolemaida, Cundinamarca. It was originally founded in 1954 by Colombia’s only ever dictator, General Gustavo Rojas Pinilla (though, of course, Colombia’s list of authoritarian rulers is much longer), and modeled on Fort Benning, Georgia, home of the School of the Americas (now WHINSEC), the infamous training ground for human rights abusers throughout the hemisphere. Like the School of the Americas, Tolemaida was to become primarily a center for training, here in anti-guerrilla (and more recently counter-insurgency) warfare, specifically through its lauded “Curso de Lanceros” course run by U.S. officers and taken by amongst others the armies of the United States, France, and Panama, as well as Colombians. Tolemaida has a permanent presence of U.S. soldiers. The Tolemaida base is located on a plateau, overlooking the river Sumapaz, an area that amongst other things contains the largest páramo ecosystem in the world, noted even within Colombia for its bio-diversity. Prior to 1954, a community on the plateau, named their settlement “El Mirador,” or “La Mesa.” One man I met, who still remembered those days, told me proudly that they had both a butcher and a soccer field. But then came La Violencia and the new military base, and the communites moved further down the hillside to the veredas of Yucala, Naranjala, and Mesa Bajo, clearing the land and planting their crops. The community has been in a state of near constant harassment ever since the base’s construction, and even more so as the base looks to expand. For example, back in the 1980’s the military cut electricity to the community. 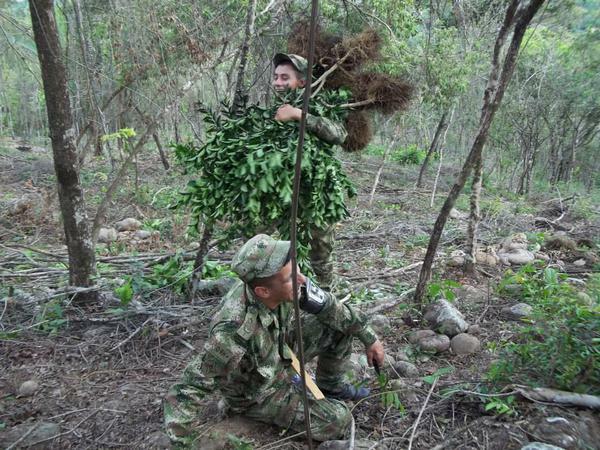 The 150 campesino families affected today, experience three main forms of harassment as part of the Colombian Army’s petty and vindictive campaign. The first is the economic blockade of the community. The small road (in a state of severe disrepair) up the hillside, turns off the Pan-American highway, and Policía Militar from the base, are posted daily on the road. Thus, the military prevents the community’s access to large amounts of food, materials to repair houses, and materials to prepare their stable fruit crops. Not even a single bag of cement comes through. People are going hungry, there is no money coming into the community, and their houses are falling down around their ears. The second is the deliberate destruction of community property. On a number of occasions over the last year soldiers have come down from the base and torn up irrigation systems and fruit trees. On June 19, 2013, over 150 fruit tres were uprooted. This carnage is a further attempt to put a stranglehold on the economic life of the community, and starve them out. The third way, and perhaps the most shocking, is the deliberate contamination of the community’s water, constituting a sort of biological warfare. 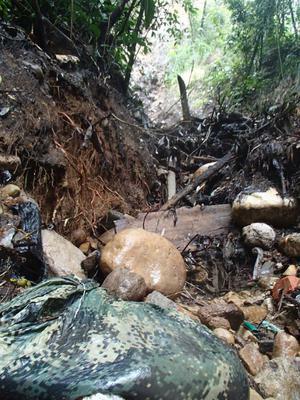 At the Cueca de la Quebrada Naranjala, the primary water source for the families, the Army has dumped the rubbish from the base, an estimated 30 tons. Battery packs, broken glass, and ceramics, slowly rotting camouflage patterned clothing and bedding, munitions boxes (labeled in English and produced in the United States), and electrical equipment of all sorts litters the fount of the stream, and in rainy season get washed down hill and collect in sodden clumps. The water is visibly toxic green in parts, orange in others, with an oily sheen, and chemical foam. The putrefaction fills your lungs and turns your stomach as you clamber over a mountain of rubbish in one of the most beautiful places in the country. The charitable could imagine this to be merely neglectful and careless, were it not for the numerous complaints raised by the community, including two (ignored) petitions at local and national level, a new case in front of the Inter-American Commission on Human Rights, and the economic harassment they have faced. But rubbish is still being dumped, and as it stands this seems to be a deliberate attack on the psychological, moral, and physical well being of these fifth generation workers of this land. The expanding military base (and not to mention the vacationing bogotanos who buy up fincas and build condominiums in the area) has squeezed the communities of Yucala, Naranjala, and Mesa Bajo from both sides in a campaign of outrageous malice. There is no explicit violence in the area, no guerrilla, paramilitary, or bandas criminales, just the economic and environmental violence of the state against this blameless community. The fatuous, meaningless motto of the Colombian Army is “Faith in the Cause”—but if we were to take this at face value, what cause is this? Another slogan is “Yes, there are Heroes in Colombia”—is poisoning wells ever heroic? This blog post has been amended to reflect the following correction: the U.S.-Colombia Defense Cooperation Agreement was never operational—implementing agreements were not signed before the Constitutional Court overturned the agreement. Nonetheless, U.S. soldiers have had a continued presence on Colombian military bases, including Tolemaida.